Last week Julia of Jada's Quilting Adventures nominated us to host the Around the World Blog Hop, so today I'm going to share a bit more about my current work in progress (while Amanda finishes up her travels down in Australia - lucky lady!). 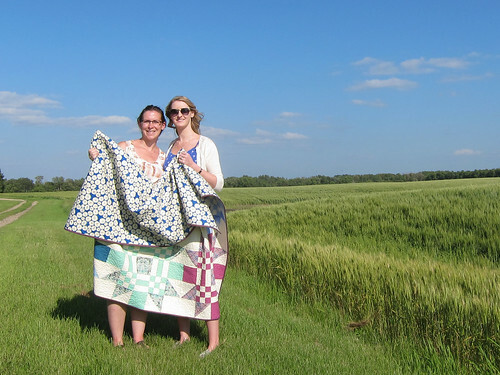 For anyone who is visiting our little corner of the blogisphere for the first time, we are cousins (Kelsey and Amanda) living in different cities (Alberta Canada and California USA), who blog about quilting, sewing, knitting and travel. We have explained a bit about ourselves on our blog before - here is a link for those of you who want to know more about us and our crafting journey. Now why don't we get to the good stuff and jump right into the questions! 1. 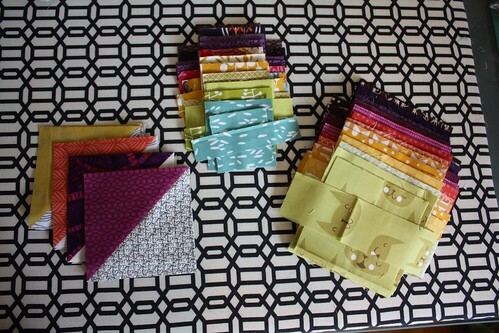 How does my quilting process work? 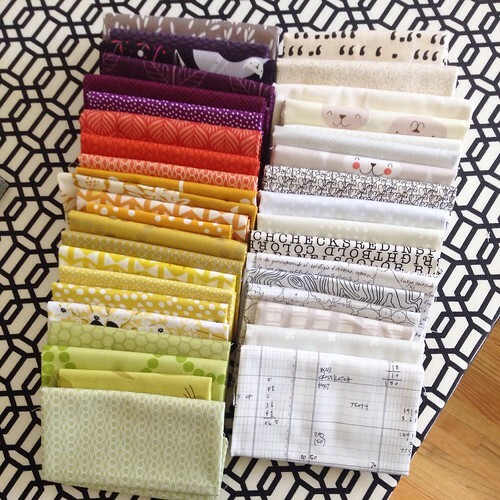 Everyone has their own process, but for me, it always come down to fabric selection. I often have an idea of a pattern or design that I want to make, but it will never ever start until I have settled on the bulk of the necessary fabric to use. 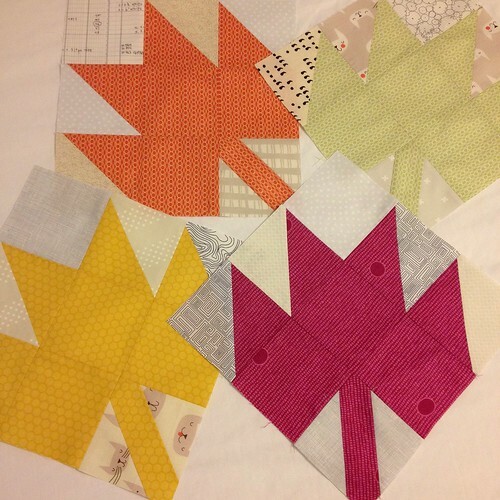 I recently pull a selection of fabrics from my stash (dusty lime, sunshine yellow, gold and mustard) for a baby quilt I was planning, only to realize the next day that it was destined to be a modern maples quilt instead. I added some orange, grape, plum and brown, then tossed in some neutrals, and a new quilt plan was born. 2. What am I working on? I'm a restless crafter, always needing a few options to choose from. Over the past few years I have learned that I do better with a few rules: a) limit my UFO and WiPs to 3 quilts, 2 knits, 1 bag/garment at any given time, and b) some form of deadline is a must, even if it's often self imposed. Today I thought I'd share some progress shots of how this fabric pull is sewing up and taking shape. You might have noticed that when I cut my fabric, a few new fabrics were added to the roster, and a few prints fell off. While I like making an initial pull, I do tend to tweak and refine as I go along. Even the most well curated fabric selections need a little help sometimes so don't hold yourself back if you're second guessing your choices. We chose to bend the rules a bit on this one by deciding not to nominate any one blogger specifically, rather we would encourage anyone to jump on this blog hop who wants to participate. If you decide to join in, please send us the link so we can follow along!